CO2, Man’s best friend. – Len Bilén's blog, a blog about faith, politics and the environment. It tells CO2 is our very best friend. Too hard for you warmists to comprehend? * The atmospheric rise in CO2 has no bearing whatsoever on temperatures in tropical and moderate climates for two reasons: It is swamped by water vapor which determines the final temperature rise. During the ice age the tropical temperature was about the same as it is today. Secondly the temperature rise due to CO2 has reached its upper limit because the free wave length of Infrared light in the frequencies of CO2 absorption is thirty to sixty feet, which means there is saturation of energy absorption, and fundamental physics holds that you cannot absorb more than all available energy for that particular frequency. There is a small additional absorption at high altitudes over the poles, so they will warm up a couple of degrees if we go from 380 to 1000 ppm of CO2. This too is good, the storms will be less severe, (the worst North Atlantic storms recorded occurred during the little ice age), and the polar bears like it a little bit warmer. (They might get competition from increased biodiversity though). The snowfalls over Greenland and Antarctica will increase, the glaciers will again increase. The biggest problem yet to be solved is insufficient amount of water in the 10:40 corridor. Even there CO2 is coming to our aid, for it enables vegetation using less water, and the yields are greater too! While this is an interesting theory and topic, it doesn’t address one major point that a lot of those suggesting alternative energy sources are pushing for. There is a finite amount of natural resources on our planet, and unless we plan on getting our electricity from and running our cars on CO2, this is still a very real problem that needs consideration. It’s not as easy as saying, “See! CO2 is good for us!” and calling it a day. There’s a lot more to consider here. Also, while one book may propose the theory that CO2 is really the best thing for us (and may be a fascinating read with lots of scientific data) there is still a lot of research going on to prove whether or not that is the case. Whether rising climate is caused by CO2 levels or not, there are plenty of other considerations. Further, if CO2 was considered to be such a wonderful, positive thing, there wouldn’t be so many companies working so hard to restore balance to the CO2 levels, and we’re not talking little homegrown companies, but the big guys, such as Shell and BP. Airlines and computer companies are offering incentives to offset your CO2 footprint. This should be a sign. Yes, maybe companies are eating up the consumer trend towards restoring CO2 levels, but they wouldn’t bother if they believed that CO2 was not a serious risk. 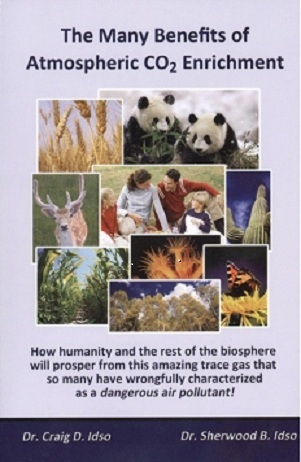 Whether rising CO2 levels are a problem or not, I don’t think just one book is going to change the world’s opinions on global climate change and the rising CO2 levels. If the information was that hard-hitting and irrefutable, it would be all over the news right now, not just in one singular book. Honestly, it may add a lot of good information to the debate, but I have to wonder if the facts are good enough to change the current trend, or if they’re all highly disputable. As for the idea that the polar bears like it warmer…when was the last time you talked to a polar bear to ask it’s opinion? That’s just one example of how these statements may be based on a lot of theoretical science and not in hard facts. It makes me wonder how much of the facts presented in this book are actual facts, or are just theories being thrown out with the authority of fact. I am an environmentalist and have come to the conclusion that CO2 is about the only thing we do not have to worry about. We must get rid of the excessive mining need. Therefore I am a strong advocate of switching to Thorium as a nuclear fuel. There is a million year supply of Thorium available at todays energy consumption. Thorium power generatioon results in one ten thousandth as much waste products as normal Uranium cycle. Wind and Solar are red herrings. Contrary to IPCC and most alaarmists there is a strong negative feedback in nature. It is called clouds. If it were not so we would have boiled over long ago in the tropics. We are in the beginning of a cooling trend starting in 1998 and that trend is accelerating. As to the polar bears, their numbers have more than doubled in the last century, so they must like it and each other. Previous Previous post: Chrislam, Crusade or Jihad? Or maybe Marx? Next Next post: The Royal Triangle of Greed. A Limerick.